Grease and flour an 11-inch tart pan with a removable bottom. Set aside. For crust: In a medium bowl, stir together the flour, granulated sugar, baking powder, salt and the 1/4 teaspoon nutmeg or mace. Using a pastry blender or 2 knives, cut in the 1/4 cup butter till mixture resembles coarse crumbs. Make a well in the center; add milk and egg all at once to the flour mixture. Stir just till moistened and dough clings together (batter should be lumpy). Spread batter into the prepared pan. Halve any large slices of frozen peaches. 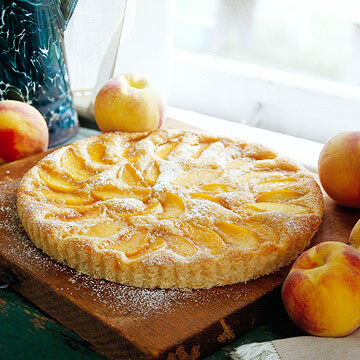 Arrange peach slices on top in a single layer. For topping: In a small saucepan, combine brown sugar, corn syrup, the 1 tablespoon butter, lemon juice and the 1/4 teaspoon nutmeg or mace. Bring to boiling. Quickly drizzle over peach slices. Bake in a 350 degrees F oven for 30 to 35 minutes or till a toothpick inserted in the center comes out clean. Cool kuchen in pan on a wire rack for 15 minutes. Remove the sides of the pan. Serve warm.